Don't miss the most recent editions of the BBC and ABC newsletters to find the most up-to-date information and news from the Blues Booster Club and the Arts Booster Club. UCC’s unique 420-acre outdoor campus, the Norval Outdoor Education Centre, will celebrate its 100th anniversary this year. To begin the celebration, Association Day on Saturday, Sept. 28 will be Norval-themed. That will be followed by an exciting event at Norval on Sunday, Oct. 6, almost 100 years to the day after the first Old Boy picnic was held there. More details and a schedule of events will be communicated at a later date. Generations of Old Boys have enjoyed Norval over the years, and you're invited to share those special memories and photos with College archivist Jill Spellman. Let’s bring Norval’s rich and interesting history to life together. 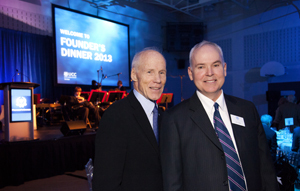 Founder’s Dinner is an Upper Canada College tradition, but keynote speaker Dr. Joe MacInnis ’56 broke with recent tradition by making his presentation near the beginning of the evening instead of waiting until the end. MacInnis — a renowned physician, scientist and author — eschewed notes to describe his experiences on the 2012 expedition overseeing film director James Cameron’s seven-mile dive into The Mariana Trench. His presentation was based around the theme of “deep leadership,” which was sorely needed during the expedition as it had to overcome the death of two crewmates in a helicopter accident, technical glitches, rough seas and more. MacInnis used slides and video clips to illustrate his points and reinforce his message that collaboration, strategic imagination, fierce ingenuity, high-empathy communication, team genius, physical toughness, mental resilience and resolute courage were the keys that led to Cameron successfully descending to the deepest known point on earth, spending three hours recording his observations and returning unscathed in his Deepsea Challenger submersible vessel. But those traits aren’t restricted to multi-millionaire adventurers. They can be applied to more everyday experiences faced by all of us. Andrew Chisholm ‘77 (who acted as dinner chairman and master of ceremonies along with his brothers Stephen ’76 and David ’89) praised the Common Ties Mentorship Program, which is now in its 10th year, before principal Jim Power spoke about the “MeriTALKracy” project and introduced a video of students, Old Boys and teachers speaking about the UCC crest and motto and what merit means to them. Power announced that the Think Ahead fundraising campaign, which had its public launch on Association Day last September, has surpassed $78 million. He also revealed “a landmark gift in support of the creation of a new character education and community initiative” that will begin with the launch of a youth leadership forum this spring and another major gift to fund a “global leadership initiative” that includes a new program that will immerse students and faculty members in the cultures of China and India. The final chapter of the evening was the presentation of the John D. Stevenson Award, which recognizes outstanding volunteerism at UCC, to graduating class of 1972 president Hugh Innes. He’s shown leadership that MacInnis would be proud of in serving on numerous boards, committees and task forces that have positively impacted the College. The UCC young alumni team won the seventh annual Canadian Association of New York Hockey Tournament in Central Park on Feb. 16 and 17. After placing first among 14 teams, the victors and their family members and friends celebrated their victory at the second annual young alumni and friends social event at Tacombi in Soho. Tacombi is owned by Old Boy Dario Wolos '96, who's very supportive of the event. Click here to read more about the charity tournament. Congratulations to John Thorp ’05, Hudson Sullivan ’04, Dave Phelan ’04, Pat Hainault ’89, Greg Lowman ’04, Jeff Taylor ’04, Ryan Taylor ’00, Pat Taylor, Brett Moffat ’03, Ryan Adams ’05, Hugh McKee ’00, Gabriel Chenard ’05 and Andrew Reburn ’06. Reunion will take place on the weekend of Friday, Sept. 27 and Saturday, Sept. 28. Classes celebrating their reunion this year are: 2008, 2003, 1998, 1993, 1988 (25 years), 1983, 1978, 1973, 1968 and 1963 (50 years). Class presidents and reunion committees are taking an active role in organizing individual class reunions in conjunction with the Association office. Please contact alumni relations and Common Ties manager Julia Melnikova to connect with your reunion class or if you haven’t been contacted by your class heads regarding your reunion, or if you're looking for general reunion information. We’ll celebrate the 150th anniversary of the Old Boys cricket match with competitions between three Old Boy teams and the College XI on Upper Canada College’s Lord’s Field on Saturday, June 1. Two matches will be played starting at noon, with high tea service followed by an awards reception and dinner at the College. Further details will be available in the coming weeks on the UCC website. Please contact Kathryn Champion or call 416-488-1125, ext. 2231 as soon as possible if you wish to play on one of the Old Boy teams. The history of Canadian cricket is the history of UCC cricket. Teacher Anthony Barber established cricket as the primary sport at the school in 1829 and continued to develop it through the 19th century. Barber is considered the founding father of Canadian cricket as he also went on to found the Toronto Cricket Club. Our cricket heritage is legendary and lives on today. The UCC cricket program was renowned for producing the best players in Canada and students and teachers from the school formed the original Canadian team that played the United States in 1844. This annual Canada vs. U.S. match continues to this day and is the oldest international competition in any sport in the world. The Old Boys match is part of our long cricket history. The 100th anniversary of this match was played in 1963 on Lord’s Field, with players and guests dressed in period costume. The governor general even arrived in a horse-drawn carriage. We plan to celebrate the 150th anniversary of the match in style and hope that you’ll join us. That was the kernel of inspiration for an ambitious new project and website. MeriTALKracy was launched in February and offers UCC luminaries (and others) a place to weigh in on the memorable Latin motto beneath the school crest: "Palmam Qui Meruit Ferat (Let he who merited the palm bear it)." It’s the unofficial secret handshake for generations of UCC alumni. But what does it really mean and how can we define merit? That’s what Seeman set out to explore. That discovery offered a perfect springboard for the UCC community to weigh in on merit, mentorship and nurturing greatness. After consulting with principal Jim Power and board of governors chair Andy Burgess, Seeman solicited contributions from a range of leaders including former federal finance minister and Canadian ambassador to the U.S. Michael Wilson ’55, former Latin teacher and UCC father Adam de Pencier, naval historian Fraser McKee ’43 and Stanley Cup–winning Toronto Maple Leaf Brian Conacher ’61. Seeman is eager for more submissions from mothers, grandparents and teachers to round out the range of contributors. Huffington Post Canada also posts a sampling of the site’s content. Click here to check out a video about MeriTALKracy that premiered at Founder’s Dinner on Feb. 13. The ultimate goal is to roll the submissions into a book. “This is a fantastic opportunity to create something that’s so in synch with UCC’s existing values,” says Seeman. Please send your submissions to uccmeritproject@ucc.on.ca. even say inspiring, growth potential. We just don't know his name yet. That’s where you come in. As an Old Boy, you can help play an important role in our recruitment process by referring a talented boy. Whether it's your own son, a neighbour's kid or a potential boarder farther afield, chances are you know that special boy. All we're asking is for you to make the introduction. Kindly contact David McBride at 416-488-1125, ext. 2220 or admission@ucc.on.ca, or fill out the form at the Alumni Referrals page. 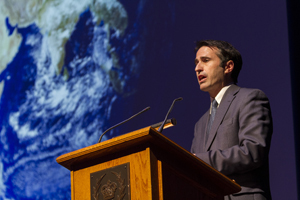 The 30th annual World Affairs Conference (WAC) welcomed more than 700 students and two dozen speakers from around North America to Upper Canada College on Feb. 4 and 5. Globe and Mail editor-in-chief John Stackhouse '81 gave the keynote address and kicked off the conference with a bang on Monday night. Drawing on decades of foreign reporting experience, Stackhouse described what Canada’s role in the world looked like 13 years after the turn of the 21st century and challenged students to expand upon that role over the coming decades. The next morning saw a spirited debate over the “death of the welfare state” involving MPP Olivia Chow, Canadian Taxpayers’ Federation spokesman Kevin Gaudet and University of Toronto professor Joseph Wong. One of the liveliest moments of the panel session occurred when Chow offered a passionate defence of the welfare state that was adamantly refuted by Gaudet. Delegates then splintered into eight plenary groups, each featuring speakers on different global issues. Plenary topics included rogue states, digital privacy, genetically modified foods, immigration, elite education, the future of marriage, subjugated peoples and Canada’s oil sands. Two of the most memorable moments from these sessions were Sun Media columnist Ezra Levant furiously arguing for the expansion of Canada’s oil sands and Evan Green, a law partner at Green and Spiegel LLP, promoting the benefits of immigration. WAC’s closing panel featured Toronto rapper Shaun Boothe. Whatever expectations were at the outset, they were easily blown away after his first number. “Unauthorized Biography” detailed the lives of key black leaders — including Martin Luther King, Jr. and Barack Obama — and quickly had the crowd on its feet. In a fitting end to a fantastic WAC, Boothe performed his single “Child Soldier” and all of the delegates sang along. WAC is Canada’s largest high school student-run conference, with an executive team made up of students from UCC and Branksome Hall, and this year’s event was one of the most successful yet. Students were able to listen to and discuss new ideas and viewpoints on some of the world’s most pressing issues, and some were undoubtedly swayed from one position on an issue to another. Upper Canada College IB2 student Eric "Kick" Manget received Canada's Medal of Bravery on Feb. 8 in recognition of saving his mother and younger brother from drowning in the ocean. The Manget family was on holiday near Hilton Head, S.C. on Sept. 1, 2010 when Eric’s mother Susan and 10-year-old brother Christian got caught in an undertow and struggled to keep afloat. Eric realized the danger they were in and swam to them. He grabbed his brother and threw him into calmer waters and then went back and dragged his mom to safety. "The adrenalin really caught up to me and I just rushed into it," Manget told Inside Toronto. "Any feelings of anxiety or panic were subdued." Governor General David Johnson presented Manget with the medal during a ceremony at Ottawa’s Rideau Hall. You can read the Inside Toronto article here. The long-standing Upper Canada College chapel service in the All Hallows Chapel, which is celebrating its 25th anniversary this year, is held at 8 a.m. on the first Wednesday of every month during the school year. An experienced minister or educator leads an opening prayer, delivers a message and then opens things up for general prayer from those who are gathered. The service is finished by 8:25 a.m. and interested participants usually have tea or coffee in the Upper Dining Hall afterward. Everyone is welcome at these monthly non-denominational services, which are generally attended by a relatively small but friendly and open group of Old Boys, past parents, faculty and staff members. All Hallows Chapel is a few steps down and to the right of the old gym from inside the College. It can also be accessed from the quad. Please email Brendan Caldwell ’87, Serge Markarov or Kate Brookes if you‘d like to be added to the chapel service email distribution list or have any questions or comments. Class Notes is the most read section of UCC’s Old Times magazine, and we hope to keep it that way for many years to come. We produce two issues of Old Times a year and ask class presidents to put the call out to classmates for updates. The Association team has received feedback regarding the Class Notes process, and we acknowledge that there’s a constant push to have information submitted and that class presidents feel pressure to have a good number of notes for each edition. We’ve therefore come up with a new format for Class Notes. Starting with the spring 2013 edition of Old Times, only information from even-numbered graduation years are included in the first issue of the year and only information from odd-numbered graduation years will be included in the second issue of the year, which will be published in the late summer or early fall. Old Boys from odd-numbered classes should keep an eye out for communications from your class presidents for Class Notes submissions in the next few weeks. We also encourage you to send your information and photos (with cutline information) to classnotes@ucc.on.ca. Please contact Samantha Kerbel at skerbel@ucc.on.ca or 416-488-1125, ext. 2239 if you have any questions or concerns. event seminar titled “Helping Your Child Build Resilience” presented by Dr. Alex Russell on Monday, April 29 at 7 p.m. in Weston Hall. Dr. Russell is a clinical psychologist and author of Drop the Worry Ball. He has more than 20 years of experience working with children and families and understands that parents struggle with common issues, including battling over homework, setting boundaries for technology use, and establishing basic rules and managing expectations at home. their children, who sometimes seem to lack initiative and a sense of personal responsibility. At home, parents complain of children who lack respect for others in the family and for house rules, or of children who show a worrying level of avoidance and focus on alternate realities like video games instead of their responsibilities in the real world. Dr. Russell helps parents get perspective on these issues, and others, in order to better position themselves alongside their children as they go through the difficult process of growing up. children can pick it up for themselves, establishing a more authoritative position in the family’s shared life at home and, ultimately, returning to that enjoyable parental role of compassionate, supportive bystander.